When the flight arrived at Lantau Island Chek Lap Kok International Airport, Hong Kong was already a myriad of twinkling lights. We were transferred to a restaurant by a coach which was arranged by the Hong Kong travel agency. After taking our dinner, we were brought to Lan Kwai Fong to discover the most famous nightlife spot of Hong Kong. When it comes to nightlife, Lan Kwai Fong is the hottest and trendiest nightlife spot in Hong Kong. Located at the Central District of Hong Kong, Lan Kwai Fong is an ever bright nightlife spot. It's an ideal shooting location for Hong Kong movies and television dramas. So, you will meet your idols at Lan Kwai Fong if you are lucky enough. Hong Kong Tourism Board spare no effort to promote Lan Kwai Fong to the world. Now, Lan Kwai Fong is not only a place for drinks, dinners with friends and nightlife hang out, it also attracts tourists from all over the world. 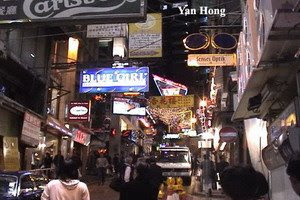 Lan Kwai Fong is a L-shaped street with numerous bars, restaurants and entertainment spots. As night falls, the twinkling neon lights brighten up Lan Kwai Fong and crowd flocks there all night long. The night of Lan Kwai Fong is forever young. You will be young too if you are at Lan Kwai Fong. As Lan Kwai Fong had become a brilliant pearl, Singapore Tourism Board transformed Clarke Quay as the clone of Lan Kwai Fong. If you are in Hong Kong and favor of nightlife then you should visit Lan Kwai Fong to explore its temptation. We used to live in Hong Kong. And, Lan Kwai Fong is definitely one of the best "night life" spot I've been. I love street views of Hong Kong. Good blog with honest and interesting content. Glad I stumbled here. It's a great day to day! Hopin you have one too! Don't forget to stop by my website at http://www.kumagcow.com Thanks! hi.. HongKong is a good city.. i wish to be there.